The app helping nuns find convents Jump to media player There is now an app that can help prospective nuns find the right convent to suit them. 'Huge crowd' as nuns made saints Jump to media player Pope Francis has canonised two 19th Century nuns who lived in Ottoman-ruled Palestine and are the first Arabic-speaking Catholic saints. Sisters get soaking for ice challenge Jump to media player Six Irish nuns take part in the ice bucket challenge. 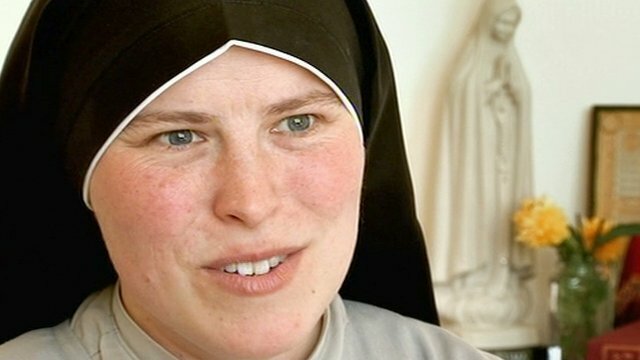 Becoming a nun 'seemed so radical' Jump to media player Sister Jacinta belongs to one of Britain's most youthful religious communities - she speaks about her decision to become a nun. It can be difficult to think of something that an app cannot help you with, and now there is one that can help prospective nuns find the right convent for them. It's a timely invention, because the number of women becoming nuns in England and Wales has reached a 25-year high.